^ DisplayPort Technical Overview (PDF). VESA.org. 10 January 2011 [23 January 2012]. ^ Video Electronics Standards Association (VESA) Endorses Alternative to Copper Cables. Luxtera Inc. 2007-04-17 [2010-01-19]. （原始内容存档于2010-02-18）. ^ WinHEC 2008 GRA-583: Display Technologies. Microsoft. 2008-11-06. （原始内容存档于2008-12-27）. ^ VESA Adds 'Adaptive-Sync' to Popular DisplayPort Video Standard. VESA. 2014-05-12 [2014-05-17]. ^ Sam. VESA宣布DisplayPort 1.2a將納入「Adaptive-Sync」動態更新率技術. 巴哈姆特電玩資訊站. 2014-05-13 [2014-05-17]. DisplayPort: A Look Inside. Bit-Tech. 2007-10-22 [2007-10-22]. （原始内容存档于2008-01-10）. Samsung's 30-inch LCD with world's first DisplayPort -- game-on HDMI. Engadget. 2007-07-25 [2007-07-25]. 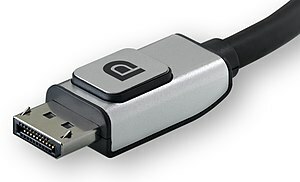 DisplayPort 1.1 Approved by VESA as Industry Standard. DailyTech. 2007-04-03 [2007-04-04]. （原始内容存档于2007-04-06）. Alan Kobayashi, Genesis Microchip Inc. Display Port v1.0 and Beyond (PDF). IEEE SCV CE. 2006-04-18 [2007-04-23]. （原始内容 (PDF)存档于2012-07-31）. AMD to Introduce DisplayPort Support in 2007. DailyTech. 2006-12-15 [2006-12-15]. （原始内容存档于2007-03-01）. Rival display interfaces face off. EETimes. 2006-05-22 [2006-06-04]. DisplayPort Receives More Major Industry Support. DailyTech. 2006-05-21 [2006-12-15]. （原始内容存档于2006-12-07）. DisplayPort's back—with Dell, HP, and Lenovo. Engadget. 2006-05-04 [2006-05-28]. New DisplayPort (TM) Interface Standard for PCs, Monitors, TV Displays and Projectors Released (新闻稿). VESA. 2006-05-03 [2006-05-28]. （原始内容存档于2009-02-14）. Commentary: Will VESA survive DisplayPort?. DigiTimes. 2005-10-13 [2006-05-28]. （原始内容存档于2008-08-29）. VESA DisplayPort Standard v1.0. Audioholics. 2005-08-21 [2007-07-16]. PC, CE firms to develop 'unified' display connector. Channel Register. 2005-05-21 [2006-05-28]. "DisplayPort" Could Introduce Protected Displays. ExtremeTech. 2005-05-10 [2006-05-28]. DisplayPort: Another Piece of Hardware That Thinks You’re a Thief. Gizmodo. 2005-05-10 [2006-05-28]. VESA Announces Plan to Develop New Digital Display Interface Standard (新闻稿). VESA. 2005-05-09 [2006-05-28]. （原始内容存档于2005-12-17）.